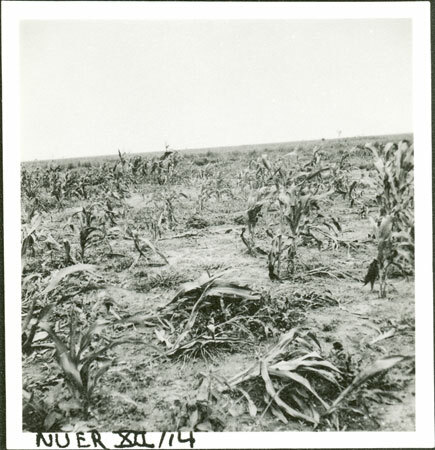 Crops, possibly maize, growing in the vicinity of a homestead. The film number suggests that this garden is in the vicinity of Yakwach village on the Sobat River, which Evans-Pritchard revisited in July 1935. This seems to fit with the stage of growth of this maize crop, which would have been planted in May or June and harvested in August during the rains. Note on print reverse ms pencil - "43 4 A87" & print front border ms ink - "NUER XII/14"
Morton, Chris. "Nuer horticulture" Southern Sudan Project (in development). 03 Jan. 2006. Pitt Rivers Museum. <http://southernsudan.prm.ox.ac.uk/details/1998.355.553.2/>.